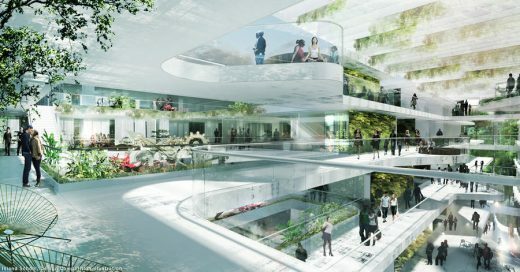 Danish schmidt hammer lassen architects and Hong Kong based Thomas Chow Architects have been appointed to design the new Island School in Hong Kong, China. The Client’s brief for the 28,000-square-metre new building is a sustainable learning landscape with state-of-the-art facilities to support optimal learning conditions for the school’s approximately 1,200 students, aged from 11 to 18. The new Island School will be placed on the site of the existing school, which was built in 1967. The site has a clear visual connection to the green mountain landscape and the Hong Kong city skyline and waterfront. This visual connection plays an important role in the schmidt hammer lassen architects/Thomas Chow Architects response to the design competition. 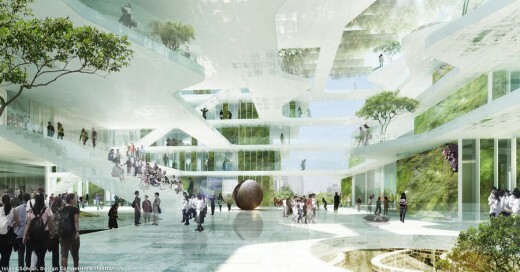 An atrium, which contains the school’s learning plaza, runs through the complex, framing the view towards the green landscape on one side and the city on the other. The visual connection supports the perception of the school in relation to its surroundings – the landscape and the city. 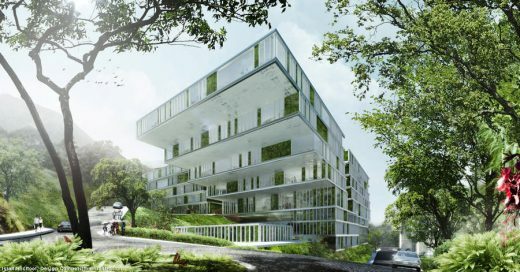 The building concept submitted for the competition was designed and organized as a sustainable learning landscape with balconies and green gardens. The shape of the building, with cantilevering facades, creates shade where needed. In other places, the facade leans back to allow daylight into the learning spaces without causing overheating. The internal functions of the building were organized around a learning plaza, which runs through the main arrival level of the school and connects to the atrium. The gardens and the greenery would also help to cool the building, contributing to a good indoor climate, while the atrium creates good lighting conditions that minimize the use of artificial light within the building. The classrooms are designed to be flexible learning spaces, which can be set up in different ways to support various learning situations. The rooms can be divided into smaller spaces or opened up to connect with other parts of the school. The concept design of the school submitted for the competition offers a strong connection to the local community, with sports and cultural facilities that can be used by the public outside the normal opening hours of the school. After the announcement of the winning design team, a co-creation process with the school will begin to create a design concept to meet the Client’s requirements. schmidt hammer lassen architects has designed a number of educational buildings that support new ways of teaching and learning. Examples include the RIBA award-winning City of Westminster College in London, the Thor Heyerdahl College in Norway and the IBC Innovation Factory in Denmark.